R.C. Woodthorpe is best known for his debut novel, The Public School Murder, but his Silence of a Purple Shirt (Death of a Purple Shirt in the U.S.), my Forgotten Book for today, seems to me to be a more enjoyable book. It was published in 1934 and featured Nicholas Slade, a novelist who appeared in one other novel before Woodthorpe abandoned him. A pity, because he and his confidential clerk Alfred Hicks make a pretty likeable Holmes and Watson duo. The story features the murder of a political agitator, and a related child kidnapping, but the real interest of this book lies in its humour – which Dorothy L. Sayers lauded in a review. Woodthorpe pokes fun at the Purple Shirts, a Fascist group who want to “Make Britain Free”. I’d say he was ahead of many writers in recognising not only the absurdity but also the unpleasantness of the reactionary groups who became so formidable in the Depression era. There are plenty of jokes, including a nice nod to Margery Allingham, whose husband Pip was once a pupil of Woodthorpe’s. before he abandoned teaching for writing. I enjoyed especially the civil servant who had written a single thriller, which sounds suspiciously like the author’s debut novel. The early chapters sparkle, and the resolution of the mystery is pretty good. I did feel, though, that the middle section of the book sagged. Woodthorpe spends ages describing an island hotel and its occupants, and although the writing is amusing, this is not enough to disguise the skeletal nature of the plot – a recurrent failing in Woodthorpe’s work. He was a genuinely talented entertainer, but not much interested in weaving complex fair play whodunits. That said, he was too good a writer to have disappeared from sight. It would be interesting to know why he gave up writing after 1940. Perhaps he felt he'd done all he can. Possibly he might have changed direction instead. I'm certainly on the look-out for the rest of his books, hard to find though they are. At the Harrogate Festival, I had a very brief but pleasant conversation with S.J.Bolton and her agent, and this prompted me to take a look at Now You See Me, for which Bolton reached the short-list for the Theakston's prize for best crime novel of the year. It's worth noting, I think, how often a personal encounter, however fleeting, will make one more interested in an author's work. I guess it's one of the reasons why publishers are so keen on having their authors attend events! On the face of it, Now You See Me is one of those books that we discussed a while back on this blog - a gruesome serial killer thriller, in which a number of women are tortured and mutilated in a variety of unpleasant ways, with the severed body parts graphically described. There are many such books around these days. Thankfully, there is more to the novel than that, and I was struck by Bolton's skilful approach to writing a book of this kind. Most of the story is told in the first person by Lacey Flint, a young woman cop who is plainly an unreliable narrator - although her type of unreliability is very different from Tony's in the masterly Julian Barnes novel I reviewed yesterday. Lacey's chapters are interspersed with various scenes in which an un-named killer torments one luckless woman after another. All the chapters are short, and so are most of the paragraphs, another stylistic device increasingly common in best-sellers. The crimes, and the amputations of body parts, appear to be modelled on the killings of Jack the Ripper. So far, so formulaic. But the story is told at a great pace, and, more importantly, with genuine attention to atmosphere. Bolton began her career writing books with rural settings, but here she conveys the dark and seamy side of London very successfully. For me, it was this atmospheric quality, not just the twisty nature of the plot, that really lifted the book out of the ordinary so that it bears comparison with the best-sellers of Val McDermid. McDermid is a highly intelligent writer who knows exactly what she is doing with each book she writes, and so is Bolton. This book is at the other end of the spectrum from the book I read immediately afterwards - the new novel by Louise Welsh, a much quieter story. But it's one of the marvellous features of the crime genre that it encompasses such very different types of novel, and that's one of the things I love about it. A couple of quibbles. One part of the plot proceeds on the assumption that hot-shot lawyers for someone accused of a very serious crime of violence would be allowed by the police - and would themselves be willing, despite the risk to their own careers - to meet and intimidate the victim within hours of the alleged crime. I found this impossible to believe, as did another astonished lawyer I discussed it with. The way this incident was explained away made me suspect the author realised she was on shaky ground. Much more trivially, Lacey keeps getting the lyric of her favourite song slightly wrong, which was a bit odd; maybe the author isn't as keen on the song as her character.. Yet all this shows is that, however hard one labours over a piece of writing, it's almost inevitable that slips will be made (believe me, I make my fair share.) What matters is that, overall, the book works in the way the author intended. And in this case, it certainly does. Julian Barnes is one of my favourite novelists,and has been for many years.It's often overlooked that, as Dan Kavanaugh, he wrote four pseudonymous detective novels, featuring a private eye called Duffy, the first of which was especially good. And his interest in plot and mystery is evident, I think, in his Man Booker Prize winning novel from last year, The Sense of an Ending. This book has so many merits, it's difficult to know where to begin. First of all, it's short!. And that, almost always is a Good Thing. Barnes shows that a great deal of ground can be covered in a limited space - if you have the requisite skill. There are some very witty lines, and some painfully acute insights into human behaviour. Although the stories are very different, some reviewers have suggested the book has something in common with The Great Gatsby. And I can see there are one or two similarities. Will Barnes' book wear as well? Too early for any of us to say, but I rather hink it deserves to. This is a book that is subtle in a very pleasing way. Even the title, echoing Kermode, is agreeably ambiguous. Many people have pointed out that it's one of those novels which cries out to be read more than once,and I strongly agree. Tony. the elderly divorced man who tells the story, is told more than once that he "doesn't get it", and on a first reading I too felt there was quite a bit I'd missed. So it proved - Tony is a classic unreliable narrator, and it was good, after finishing the book, to go back to the early pages and look for some of the clues (and there are clues, placed with Christie-like cunning) that help one to understand the story of Adrian Finn, his suicide, and its aftermath. There are also a couple of red herrings, a cryptic equation worthy of J.J.Connington, and an unexpected "solution". One of these days, I bet, someone will write a learned article on the connections between this book and detective fiction (it would be unwise to overstate those connections, but I believe they do exist.). Because it's a short book, I don't want to include spoilers. Suffice to say that Tony's story begins in his youth, whizzes through most of his life and then really takes off when he receives a mysterious message from the lawyer acting for the estate of a woman he only ever met once. He finds that memories, and his account of his own past, are fallible to say the least. And that is not all....This is a fascinating book, strongly recommended. As I’ve mentioned before in this blog, Chris Ewan is one of the most interesting young writers around. He has my admiration not only because of his entertaining crime novels, but also because he was brave enough to quit the law at a young age in order to write full-time. Something that, for a variety of reasons, I never really contemplated. Chris’s career is taking off in a big way with his move to an excellent publisher, Faber, and his latest novel has just come out. This is Safe House, a stand-alone thriller of which I had an enjoyable sneak preview earlier this year. It represents a departure from his earlier work, and a step forward in career terms, I’m sure. Rob Hale wakes up after a motorbike crash and wonders what has happened to the woman who was his passenger. But he is told he was riding alone. This is a teasing situation with which to kick-start a thriller, and although we never doubt that Rob is right, the twists keep coming as a mystery from Rob's past is unravelled, though not in the way one might expect. One of the best features of this book is its setting, in the atmospheric Isle of Man. I’m very keen on the island, which is rich in character, and once wrote a short story set in Peel; it was called "Sunset City". Chris, who has lived there with his wife Jo for a number of years, knows it inside out. This lends an authenticity to the story which is highly appealing. I’m sure Safe House will be a great success and expand his readership yet further..The photos, by the way, were taken over a very enjoyable week-end I spent on the island with Chris and Jo last year. I hope to get back there before long. Newton Gayle is one of the most obscure writers to have been elected to membership of the Detection Club during the Golden Age. In fact, the pseudonym conceals the identities of two writers: the American poet Muna Lee and the British businessman Maurice Guinness. Their third joint effort, Murder at 28:10, is my Forgotten Book for today. The politics of the day play an important part in the story, but didn’t mean a great deal to me. An attempt is made to murder an “internationalist and anti-imperialist” and, when the hurricane strikes a lonely mansion, the culprit takes advantage of the chance to finish the job. The setting provides a closed circle of suspects, and the build-up of tension is very well done. But although the plot is sound, I felt that the characterisation was the flimsiest part of the book – for instance, a promising suspect, a woman novelist, is never adequately developed. I was also rather disappointed by the murder motive. Had the people in the story, including Greer and Upwood, been more memorable, this would have been an outstanding book. My guess is that Lee did the writing and Guinness the plotting, though I’m not sure about this. Nor do I have any information as to whether either of them ever played any part in the activities of the Detection Club – I doubt very much whether Lee did, though Guinness (whose cousin, a literary agent, was the ex-wife of Sir Hugh Greene, and engaged to Raymond Chandler at the time of Chandler’s death) may have done. But on the evidence of this novel, “Newton Gayle” was certainly a capable writer. I was sorry to learn of the death of Nina Bawden, at the age of 87. She was a gifted writer, and although I never got the chance to meet her, everything I've read about her suggests a charismatic and admirable person, who had perhaps more than her fair share of tragedies to face in life. What is not so well known about her is that she began her career as a crime writer. Her first book, Who Calls the Tune, was published by Collins Crime Club, and coincidentally I managed to purchase a copy recently, though I haven't read it as yet. I have, however, read her second novel, The Odd Flamingo, a couple of times. Some of you may recall that I chose it as a Forgotten Book worth remembering in this blog a couple of years ago. It was first published in 1954, and twenty-six years later that excellent critic and crime novelist Julian Symons chose it for inclusion in an excellent series of a dozen books to celebrate the Crime Club's Golden Jubilee. In a typically pithy and insightful introduction, Symons says that her crime novels were "plotted with outstanding cleverness, but they are much more than five-finger exercises if considered as novels - that is, in terms of characterisation and emotional impact. "The mystery concerns the apparently nefarious activities of a seemingly respectable head teacher, and the eponymous Odd Flamingo turns out to be a drinking club that is vividly evoked. Back in the early 80s, I was initially drawn to the book not only because I trusted Symons' judgment but also, as a newly qualified solicitor, by the fact that the narrator is a lawyer. In fact, Will Hunt's legal life is not in fact the focus of the story, but that didn't matter at all. It is a very readable book and, when I returned to it a few years ago, both I and someone to whom I recommended it enjoyed it all over again. After The Odd Flamingo, Bawden abandoned crime fiction - a shame,because she might have written some remarkable books within the genre. But she went on to write fine books of other kinds, and I agree with Symons that her criminal apprenticeship stood her in good stead. There is, as he says, often some sort of quest or mystery at the heart of her better known stories. Her death is a loss, but I'm sure her reputation will endure. Kate Clarke is someone I’ve never met in person, but she once was shortlisted for a CWA Gold Dagger for Non-Fiction, and I’ve been delighted to make her acquaintance through cyberspace in recent times. She’s written a number of very interesting books, and I’ll have more to say about another of them some other time. Today, though, the focus is on her recent title Deadly Service, accounts of seven cases where employees were accused of killing their employers. “I have often wondered what ignites and unleashes an uncontrollable fury in servants who kill their employers, exposing the smouldering resentment in those who finally rebel against a life of servitude. Surprisingly, perhaps, this type of killing is relatively rare and when one considers the degradation and exploitation experienced by generations of servants, it is remarkable indeed that so few have resorted to murder. Surely it could not have been merely the fussy, ostentatious ways of Mrs Julia Thomas that drove her surly housekeeper, Kate Webster, in 1879, to push her down the stairs and then systematically dismember her body and boil the bits in the kitchen copper? Could it be that the obsequious widow, Jane Cannon Cox, was so determined to maintain her luxurious life-style as companion to the wealthy Florence Bravo, that, in 1876, she was prepared to kill Charles, her mistress’s new husband, with enough antimony to ‘kill a horse’? Intriguing, don’t you think? The butler may not have done it as often as cliché suggests, but you don’t have to be an employment lawyer, to appreciate Deadly Service! A highlight of a very enjoyable week-end was my first ever visit to Pendle, home of the legendary witches. I live only an hour’s drive from Pendle Hill, so there’s really no excuse for the fact that I’ve never visited this fascinating – and very attractive – part of Lancashire before. All the more so since, back in 2005, I wrote a story for one of Mike Ashley’s anthologies of historical whodunits, the plot of which was influenced by the story of the Pendle witch trials. However, I set the events in familiar territory, my home county of Cheshire. The story was called “The Witching Hour” and it's one of my least well-known stories, though maybe one day it will enjoy a new life thanks to digital publication. As it happens, now is an especially good time to go to Pendle. 2012 sees the 400th anniversary of the famous trials and I was startled to see the date “1612” picked out, very noticeably, on the hillside. Some locals, I gathered, are not thrilled about this, but it certainly made for a striking image. Saturday also saw massive celebrations in the nearby village of Barley. The little place was full of life – and witches in full regalia. When we there, some of the women in pointed hats were boogying to the music from a band. A typically quirky English scene, and all the more pleasing because the weather was – for once – fantastic. Panic Button is a 2011 horror movie which is sensibly short and sharp. Many of its ingredients are genuinely interesting, though whether director Chris Crow made the most of them is debatable. I really liked the premise. Four youngish people, two men and two women, who participate in a social networking site, win a dream trip by private jet to New York. But when a disembodied voice invites them to play some in-flight games, events take a sinister turn. What are the secrets of the four passengers, and why have they been chosen for the trip? We have been prepared for something grim by the fact that, before the credits rolled, one of the character’s homes was invaded by masked intruders. Events on the flight become progressively darker as the m minutes pass, although I could never figure out why the plane was actually – as the luckless quartet discover – heading, not for New York, but for....Norway. The pace of the film doesn’t quite disguise the various plot holes. There is an intelligent idea – about the dangers of social networking, and in particular bullying in cyberspace – at the heart of the story, but it is rather lost in the frenetic action. So the film is exciting, on a superficial level, but in some ways a bit of a mess if one stops to analyse it. The final twist, though clever, comes completely out of the blue, and some foreshadowing would have been a good idea. A bit more characterisation – not least of the villain of the piece – would also have helped. All in all, a film worth watching, but not as good as it could have been. When a crime writer chances upon a terrific idea for a mystery story, it’s a great feeling. It may be a fresh idea about character, say, or relationships. During the Golden Age of detective fiction, it was often a novel method of murder. But whatever the idea may be, however marvellous it may seem, one needs to keep it under control. For an idea that gets out of hand can create fundamental problems, for instance with credibility. This is my reservation about an interesting, but in my opinion significantly flawed, novel by J. J. Connington, The Castleford Conundrum, which is my choice for today’s Forgotten Book. I’m pretty sure that Connington came up with a particular plot twist, neatly derived from legal precedents, and wove his story around it. Fair enough – in fact, more than 20 years later, another notable writer, Cyril Hare would make use of a very similar idea. But here, at least, I think Connington tested the suspension of disbelief to breaking point. In many ways, though, this is a typical whodunit of the traditional type. As in so many books written in the Thirties (this one was first published in 1932), the murder victim is a disagreeable and rich individual, who unwisely allows it to be known that she is planning to change her will. Since almost all members of her family are equally unappealing, there is no shortage of suspects when she is found dead. But it is only when Sir Clinton Driffield makes a belated appearance that events start motoring to a conclusion. Pleasingly, this book has benefited from a recent reprint by Coachwhip Publications, and it includes a welcome and characteristically informative introduction by Curtis Evans. I am a Connington fan, although I’m afraid I don’t rate this book as highly as Curt. The long trudge towards a foreseeable outcome (once you have figured out that central plot gimmick, which I did quite early on) is rather dreary. The book is an example of Connington’s admirable willingness to ring the changes in his plotting, and the book retains a historical interest, at the very least. But I was left wondering this – why on earth did the killer go to so much bother? On a bus tour around the Gibraltar last week, the driver played excerpts from a James Bond movie, The Living Daylights, which was shot on the Rock. Yet I can’t think of any crime novel which has featured the Rock – surely there must be some thrillers, at least, set there? It’s certainly a fascinating location, one I enjoyed visiting this time even more than on my first trip more than 20 years ago. The atmospheric nature of the place is heightened by its proximity to Spain and Africa, and the continuing tension created by political tensions arising from the very evident, and passionately felt, desire of the inhabitants (certainly including our bus driver) to retain their links with Britain. An extraordinary, and evocative, part of the world. I’ve mentioned before my enthusiasm for cruising, and I’m especially keen on itineraries that don’t have too many days at sea, but which call in to a wide range of ports. This provides the opportunity to sample places and figure out destinations that would be worth prioritising for a longer look. On recent holidays, I’ve been very taken by Santorini, Madeira and Rhodes, and although Gibraltar is tiny, I would be keen to return there before too long. By the way, I couldn't resist including a photo not only of a wonderful Barbary macaque family, but also one in which I'm accompanied by my recently appointed publicist! Catherine hopes to develop a career in PR or journalism when she finally leaves Oxford. Suffice to say that if she manages to improve my profile, she'll surely be able to rise to any other challenge! Thirteen Steps Down, by Ruth Rendell, is one of her more striking books of the last ten years, and so I looked forward to tonight’s first part (of two) of an ITV adaptation with much relish. At one time, Rendell mysteries were impossible to avoid, even in the unlikely event that you wanted to avoid them. They were a staple of the television schedules (apparently ITV produced more than 80 Rendell stories, many based on her short stories, and there were BBC adaptations as well). Many of the old episodes keep cropping up on the repeat channels, but this is the first new Rendell on ITV for twelve years. The press pack spoke of Rendell being “rediscovered for television” – blimey, how soon they forget! Mix Cellini (played by Luke Treadaway) is a mechanic who lives in a London flat and is fascinated by the John Reginald Christie murder case – and also by a glamorous model. Geraldine James, superb in a challenging role as a crotchety octogenariian with an equally strange obsession about a past romance, plays his landlady, Gwendolen, while Elarica Gallagher is the model. Mix is a good example of a typical Rendell protagonist – a superficially attractive, but deeply troubled youngish man whose obsessions and warped moral values lead to calamitous consequences. Treadaway veered more towards unpleasant than appealing in his portrayal of Mix, and I felt this was a mistake; it's the apparent charm of Rendell's sociopaths that makes them so memorable. I’ve often said in interviews that Rendell is the living crime writer whom I most admire; her work has given me enormous pleasure ever since I first read the brilliant The Lake of Darkness. That is still the case, although I do worry that there has been (by her exceptional standards) a bit of a falling-off in her work over the past fifteen years. Themes, and plot elements, have tended to recur, but not with quite the flair of the past, and since she was elevated to the House of Lords, she has made some attempts at political and social comment in her novels, which have seldom worked well. Perhaps some decline is inevitable, especially with a writer who has been so prolific. But this creepy, if at times unsubtle, TV adaptation is a reminder of what a gripping story-teller she is. It's not as good as the book, but I shall certainly be tuning into part two. Casablanca is a place I’ve fancied visiting ever since I saw the famous movie starring Bogart and Bacall. Not a single scene in the movie, mind you, was actually shot in Casablanca. Another piece of trivia about the film is that the screenplay was based on a stage play that, at the time, had never had a theatrical production. It was called Everybody Comes to Rick’s. Anyway, I finally satisfied my curiosity about the Moroccan city last week when it was one of the ports visited on a short cruise themed around ‘Moorish delights’. Casablanca turns out to be a vast, bustling commercial hub, its stand-out “sight” being the massive, and massively impressive, Hassan II Mosque, wonderfully situated on a promontory jutting out into the Atlantic. Another trip was to Tangier, with its colourful old town and markets. It’s a place rich in atmosphere and history, and has featured in various thrillers, including one of the Modesty Blaise stories. Of the two cities, I found more of interest in Tangier, though of the four Moroccan cities I’ve visited, Marrakech remains far and away my favourite. There’s something fascinating about having the chance of a glimpse of a very different culture, and brief – and inevitably superficial - as my glimpses into Moroccan life have been, they might well surface in a short story one of these days. Which was the first detective novel to feature a serial killer? I use the term “detective novel” to exclude book such as The Lodger, by Marie Belloc Lowndes, which is a suspense story heavily influence by the crimes of Jack the Ripper, and which Hitchcock turned into a film early in his career. I stand to be corrected, but the first serial killer detective novel I know of is The Murders in Praed Street, by John Rhode, and that is my Forgotten Book for today. Today, the plot twists may seem shopworn to seasoned whodunit fans, but this was a ground-breaking book when it appeared in 1928, and I enjoyed reading it. The luckless denizens of Praed Street start to fall victim to a signature killer of considerable ingenuity, and the police are baffled until Dr Priestley helps them out. One of the murders involved the use of “a remarkably virulent synthetic alkaloid”, prompting the good doctor to reminisce about one such alkaloid with which a character in The Ellerby Case “tipped the spines of the hedgehog to which I so nearly fell a victim. You remember that incident, I dare say?” Odd question. Who could forget an attempted murder by hedgehog spines? Within a few years, serial killer (or “multiple murder”) mysteries became relatively common. 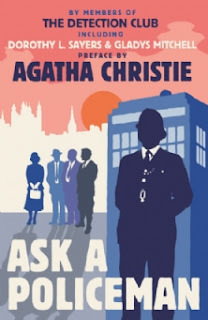 Philip Macdonald wrote two, Anthony Berkeley and Francis Beeding had a go too, and Agatha Christie produced that wonderful puzzle The ABC Murders. But Rhode deserves credit for leading the pack. Today, of course, serial killer novels are two-a-penny. I doubt if many of those who read them know the name of John Rhode. And, whatever his literary limitations, I think that is a pity. It is quite some time since I read one of Ross Macdonald's private eye novels featuring Lew Archer, but I was prompted to give him another go by the republication of The Underground Man - and I'm very glad I did. The paperback is one of a number that have now appeared as Penguin Modern Classics. Is it over-stating the case to call Macdonald's books "modern classics"? An interesting subject for debate, but for my own part, I'm pleased to see their quality recognised in this way. The Underground Man dates back to 1971, but you can't call a modern classic a forgotten book - can you? - which is why this appreciation isn't appearing on a Friday! Archer becomes involved in a case which sees a teenage girl abducting a young boy, but it turns out that the girl is as much a victim as the boy. As usual with Macdonald, the story involves the gradual revelation of long-buried family secrets. There is a crowded cast of characters - so crowded, in fact, that occasionally I lost track of who was who. With many writers, this would be a major criticism, but somehow I didn't mind. I find Macdonald's writing almost hypnotically readable. He creates a fascinating picture of a sunny yet tainted world and his characters are concisely but compellingly portrayed. Another strength in this book is that the plot is very neatly constructed. I didn't pick out the culprit, and I found the key elements of the story believable and, as is often the way with Macdonald, rather poignant. I shall soon be having a read of one or two more of the new reissues. Well done to Penguin for reintroducing me to a very enjoyable novelist. We Need to Talk About Kevin is a 2011 film based on Lionel Shriver’s best-selling book. I still haven’t got round to reading the novel, but I’ve long been intrigued by the way Shriver ‘broke through’ as an author after publishing half a dozen books which made (relatively) little impact. She’s indicated that this isn’t because her best-seller was necessarily a much better book than its predecessors, but rather because her story-line just happened to capture public attention at the right moment. In the first place, the book’s reputation spread by word of mouth, always a powerful recommendation. The film stars Tilda Swinton, whom I’ve seen in one or two less than engrossing movies over the years. Here, though, she is at her very best, playing the part of Eva, mother of Kevin, who turns into a spree killer. The film charts the troubled relationship between mother and son in an unflinching way, and the switches between past and present are handled much more effectively than is often the way. Kevin takes pleasure in hurting others, and it becomes increasingly clear that he is capable of inflicting appalling cruelty. His father is complacent, but Eva’s slowly growing horror as she becomes more and more clear about her son’s true nature is skilfully portrayed. Most people, including me, struggle to understand what motivates a spree killer such as Kevin. We find their mass murders appalling, but it is almost impossible to know for sure how further outrages – the Colorado killings are a recent example – can be prevented. Gun control is a big issue in the US, of course, but even the UK’s post-Dunblane society is not immune from these terrible tragedies, which so often end up with the killer dead as well as his victims, as with the horrific murder spree of Derrick Bird in Cumbria a couple of years ago. This film, and no doubt the book, offers no easy answers, but the portrayal of Kevin and his family background still struck me as insightful, as well as chilling. My Forgotten Book for today is an early effort by the prolific Christopher Bush, who began writing in the Golden Age and kept going through the Swinging Sixties. The Perfect Murder Case (1929) is, as far as I know, the very first of those mystery novels in which a murderer plays a game with the police, and to that extent it is a pioneering effort. Various newspapers, as well as New Scotland Yard, receive a letter from “Marius” which opens: “I am going to commit a murder.” He adds that “by giving the law its sporting chance I raise the affair from the brutal to the human.” You don’t get such sportsmanship in crime nowadays! The detective work is mainly done by a former cop called Franklin, although Bush’s usual protagonist, Ludovic Travers, contributes to solving the puzzle. There is a lot to admire about this book, but I did feel that the investigation became rather rambling and I couldn’t summon up much interest in either the victim or the suspects. Bush was a writer whose limitations kept him out of the top rank. But he had talent, and interesting and relatively fresh ideas, and The Perfect Murder Case is sure to interest anyone keen on the history of the genre. I've blogged ,previously about the Detection Club's collaborative novel Ask a Policeman, and now I'm delighted to say that this fascinating book is to enjoy a new life in an edition to be published by Harper Collins on 30 August. This edition is reproduced from a first printing and beneath the appealing new dust jacket (see above) the binding replicates that of the original edition. It follows on from Harper Collins' extremely successful reissue last year of The Floating Admrial. I'd be glad to see the book reappear in any circumstances, but there are a couple of features that I'm especially happy about. First, this edition contains an essay written by Agatha Christie about her fellow detective novelistss, which is truly insightful, especially as she writes with an unexpected candour (the essay was written for publication in Russia and did not appear in the UK at the time). And second, the book contains a brand new introduction, commissioned by Harper Collins - and written by me! Regular readers of this blog will not be surprised to find that this truly was a labour of love. I'm delighted to be associated with a book that is a classic of its kind and which will, I hope, amuse a new generation of readers as much as it did on its original appearance. The contributors to the narrative, by the way are some of the great names from the Golden Age: Anthony Berkeley, Dorothy L. Sayers, Gladys Mitchell, Helen Simpson, Milward Kennedy and John Rhode. Cypher, also known as Brainstorm, is a 2002 film which I'd never heard of until I chanced upon it while glancing throught the TV schedules. It was billed as a "tricky thriller",which was just about enough to tempt me, and I'm glad I watched it. Though the most strking of the various plot twists reminded me of another, very famous film, it is intriguing from start to finish. Jeremy Northam gives an excellent performance in the role of Morgan Sullivan, a nerdy character who gets involved in industrial espionage. A company hire him to spy on its rival, and he assumes a false identity. Soon he has reason to suspect the motives of Digicorp, his new employers, and he also becomes fascinated by a glamorous woman called Rita Foster, played by Lucy Liu, who appears to be working for the rival conglomerate, Sunway. There are sci-fi elements to the story-line, but in essence it is indeed a thriller, playing with concepts of identity and reality. Sulivan becomes a double agent - but who is he really working for? Rita suggests that a mysterious individual called Sebastian Rooks is behind what is going on. But who is Rooks, and what is he trying to do? This is probably a film that deserves to be watched at least twice, once with the knowledge of the central plot twist. I haven't done that as yet, but even on first viewing I enjoyed Cypher, partly because of the story-line, and partly because both Northam and Liu tackle fairly challenging roles with gusto.